1. Competition from Comcast: Shares in Disney, Comcast and 21st Century Fox could be on the move after Comcast formally bid $65 billion to buy Fox assets. Shares in Fox surged by 7.5% on Wednesday in anticipation of the offer. The bid is a dramatic attempt by Comcast to thwart Disney (DIS), which reached a $52.4 billion deal in December to buy the same Fox (FOX) film and TV assets. The Comcast (CMCSA) move came one day after a judge approved AT&T's (T) $85 billion acquisition of Time Warner (TWX), which owns CNN and HBO. The ruling is expected to mark the beginning of a frenzy of consolidation in the media industry, as traditional players look to join forces and grow in order to challenge powerful tech companies, including Netflix (NFLX) and Amazon (AMZN). 2. Downbeat stocks: Global investors are digesting the latest Federal Reserve interest rate hike, which has weighed on stock markets. 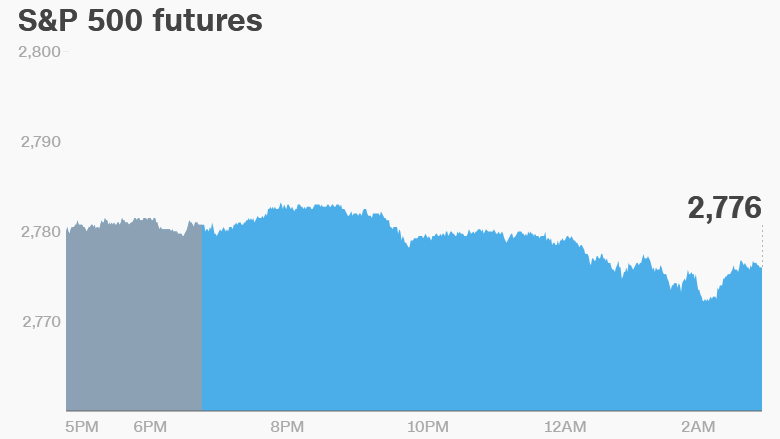 US stock futures dropped Thursday and European markets slipped in early trading. Asian markets ended the day in negative territory, with some markets down by more than 1%. While the mood is downbeat, the tech-heavy Nasdaq hit a new intra-day trading high on Wednesday before reversing course. 3. Volkswagen fine: Shares in Volkswagen (VLKAY) were down 1% after German prosecutors imposed a €1 billion ($1.2 billion) fine on the automaker for rigging diesel engine emissions worldwide. The automaker said it accepted the penalty, which related to inadequate oversight in the department that develops powertrains — engines and transmission systems. Prosecutors said it was the biggest fine ever imposed on a company in Germany. 4. Job cuts: Shares in UK engineering company Rolls-Royce surged by 3% after it said it would cut 4,600 jobs. The firm said that it would make the job cuts over the next two years as it seeks to reduce annual costs by £400 million ($535 million) by 2020. Most of the job losses will be in the United Kingdom. 5. Earnings and economics: Michaels Companies (MIK) will report earnings ahead of the open. Adobe Systems (ADBE) reports quarterly results after the close. The European Central Bank is set to issue its new interest rate decision at 7:45 a.m. ET. This will be followed by a press conference at 8:30 a.m.
Investors will be looking for clarity on whether the central bank will pull the plug on its massive stimulus program.